Top 10 Reasons Why I Love Malaysia! Happy Merdeka to all my Malaysian readers, bloggers and friends!!! Since today we are celebrating our 53rd Independence Day, I am coming out with a Top 10 Reasons why I love our beloved country Malaysia!! Let's begin, shall we? 1. Malaysia's weather is hot and humid all year round. Although this may be uncomfortable, the humidity is good for our skin and helps all of us look younger! 2. Malaysia has some of the best food in the world. Think nasi lemak, char koay teow, roti canai, teh tarik, cendol, satay, chicken rice, keropok lekor, bak kut teh, etc. etc! 3. 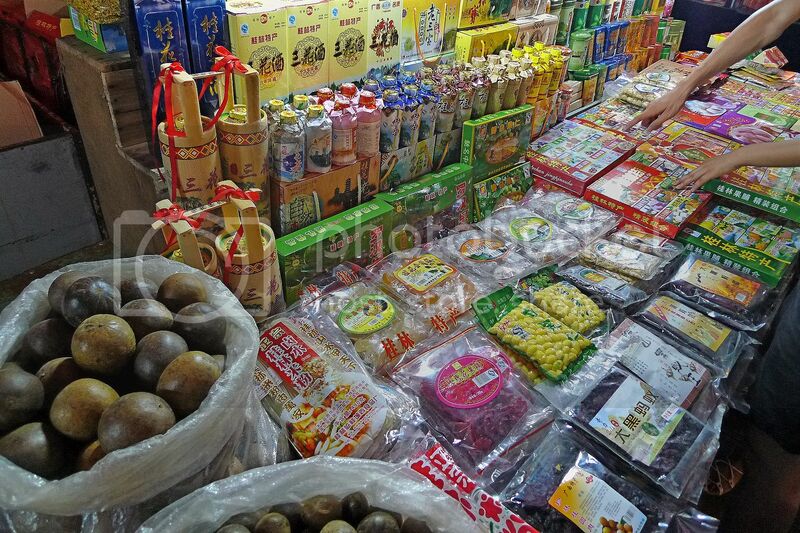 Malaysia is home to some of the best variety of fruits in the world! Where else can you get durians, mangoes, papayas, pineapples, tarap, mangosteens, dragonfruits, rambutans, guavas and bananas in one place? 4. Malaysia is free from major natural disasters! 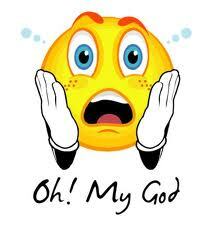 We do not have earthquakes, volcano eruptions, typhoons, twisters and blizzards! 5. Malaysia has some of the best beaches in the world. 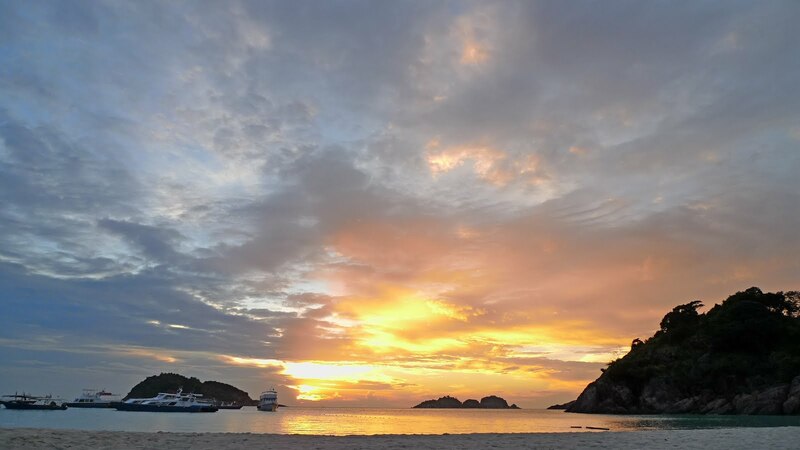 Think Sipadan, Perhentian, Tioman, Redang and Manukan! 6. Malaysians are generally peace loving and all three major races live in harmony here! It's only the politicians who are trying to spoil it all for us! 7. Malaysians love to eat and we have 24-hour eateries! The only downside to this is we are getting fatter and fatter! 8. Malaysia has the tallest Twin Towers in the world! It's also the most beautiful Twin Towers! 9. Malaysians are generally warm and friendly. In fact, we are in the Top 10 most tourism friendly countries in the world! 10. Malaysia is among one of the countries in the world with the most public holidays. Now I like that a lot! Haha! Although Malaysia is not perfect, and no country in the world is, I still think the positive aspects of Malaysia far outweigh the negatives. So let us focus on the positives, shall we? The grass is not always greener on the other side. Let's appreciate our beloved Malaysia. Top 10 Things That Make Me Say OMG! OK, just for once I shall write a very short post. 1. I am in the middle of nowhere and my iPhone battery goes dead. 2. I dine at an expensive restaurant and when it comes to paying the bill, I can't find my wallet. 3. Mariah Carey's pregnancy is false and she is in fact, just plain fat! 4. The final scene of Inception. 5. Lady Gaga is following me on Twitter. 6. Taylor Lautner reveals on Oprah that he is a girl! 8. 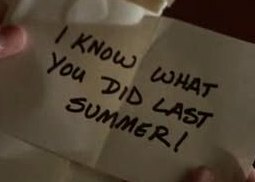 After watching a disturbing video, I answer a phone call and a very creepy voice says "Seven days." 9. I die, go to heaven, and God says to me "Congratulations! Welcome to the real world. You are now out of The Matrix." 10. I just came up with this Top 10 in under 10 minutes! 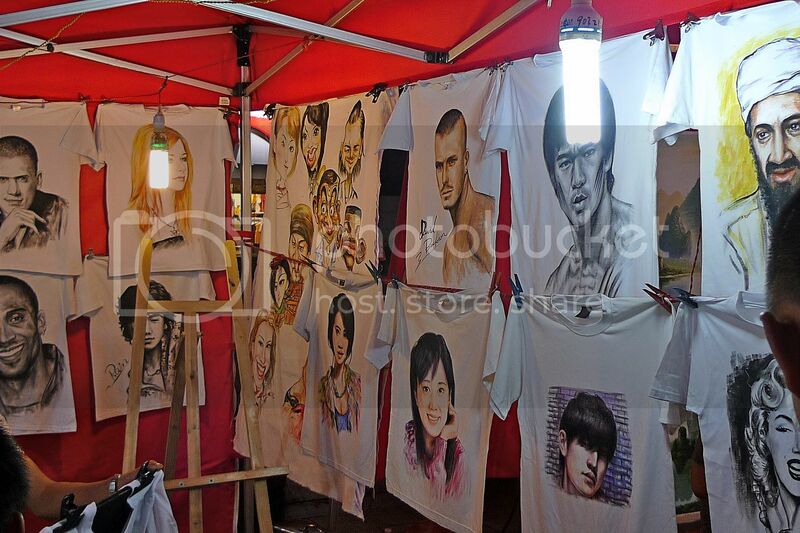 I Saw Jay Chou At Guilin Night Market! 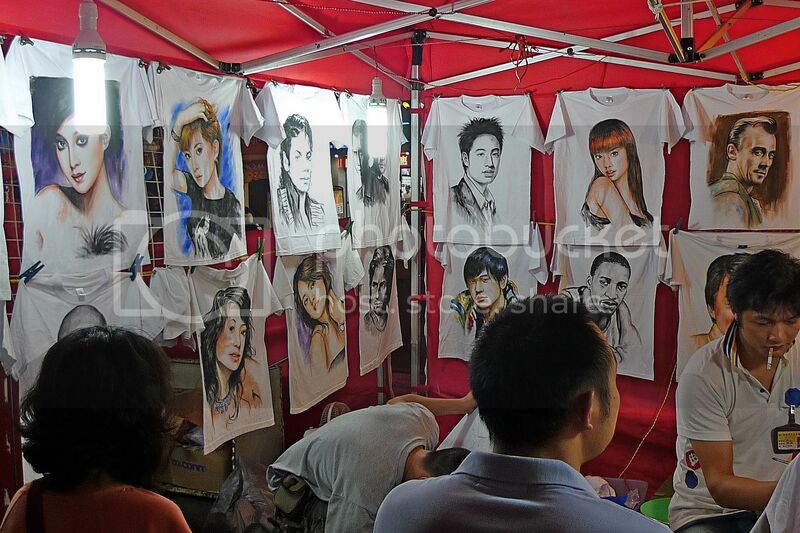 Yes, I saw Jay Chou at the Guilin Night Market! But let's not jump the boat. After we came back from Daxu Ancient Town, we went back to our hotel, took a shower and went straight to sleep! We slept for about one and a half hour then proceeded to go out for a simple chap fan (economy rice) dinner. No photos of the chap fan as they were just the normal rice with meat and vegetables. After dinner, we decided to visit the Guilin Night Market which was located along the Zhong Shan Road, the main road of Guilin City. 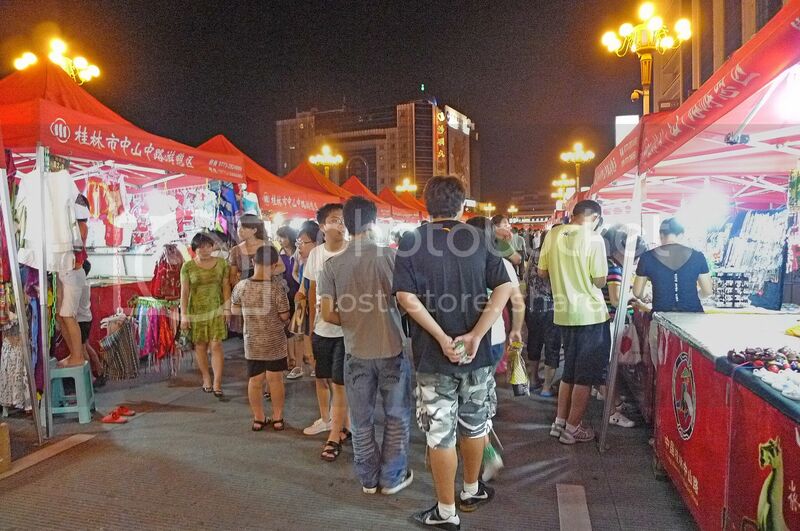 The night market was probably a few blocks long, with hundreds of stalls in red tents. 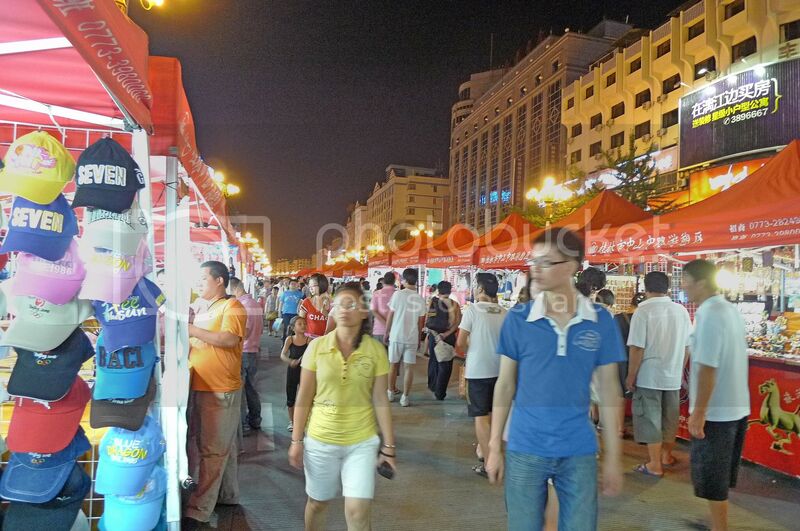 It seems that every night, small Chinese merchants would come to Zhong Shan Road and set up stalls at this night market. There were many things on sale and the good thing is you can bargain to your heart's content. Definitely a bargain shoppers paradise! Third row from the bottom - can you see what looks like round buns? I did not get a close shot of these buns but they looked like the real thing, all ready to be eaten! 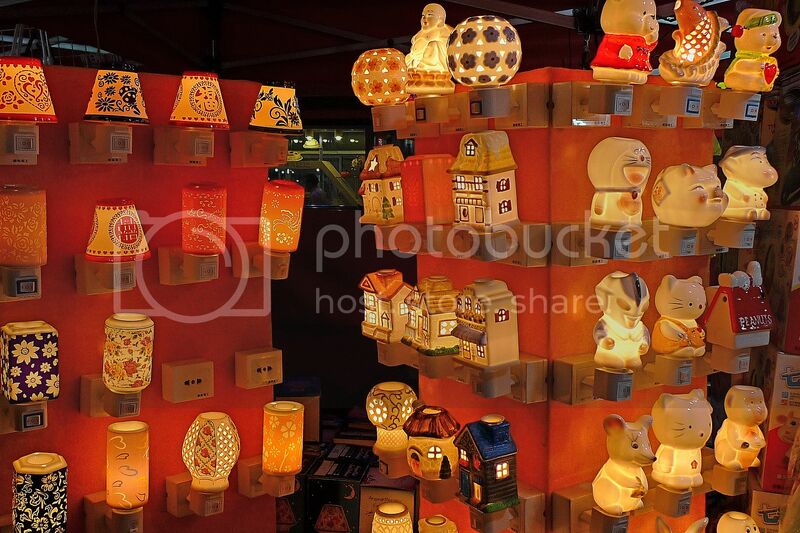 Lights with cute and attractive designs! Can you see Doraemon, Ultraman and Hello Kitty? 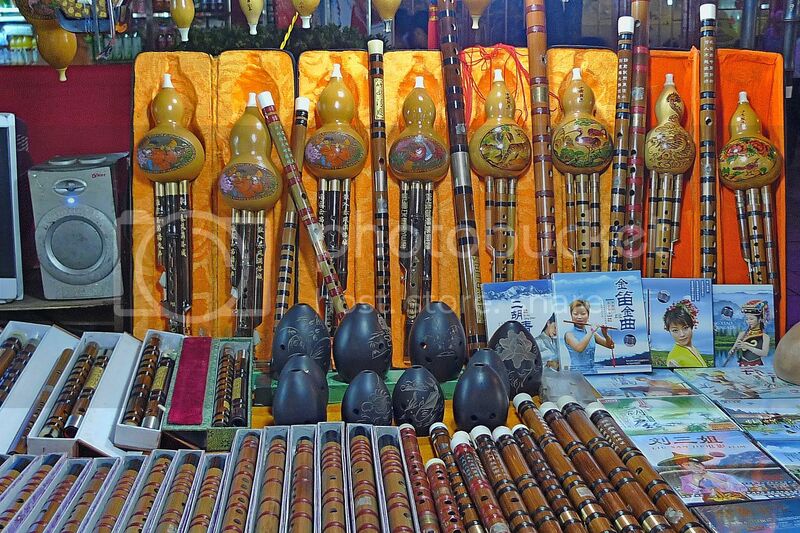 Chinese musical instruments and music CDs! Can you see those black, egg shaped instruments? They are called Xun, a flute-like instrument that is made of clay or ceramic. I have seen these ancient Chinese musical instrument on TV before but it was my first time seeing the real thing here in Guilin! I was so excited I almost ended up buying one. It seemed to come with an instruction manual teaching you how to play the instrument. 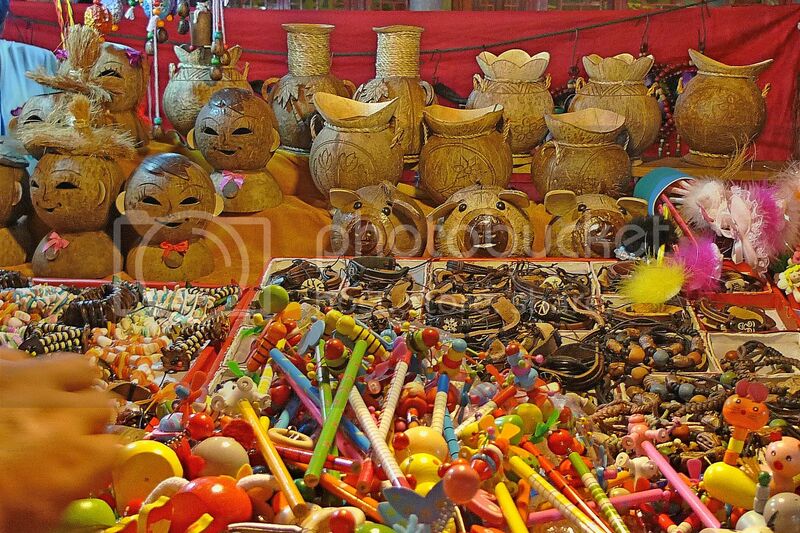 Handicrafts galore! These looked pretty cute! Food, snacks, fruits and drinks were also available at this night market. 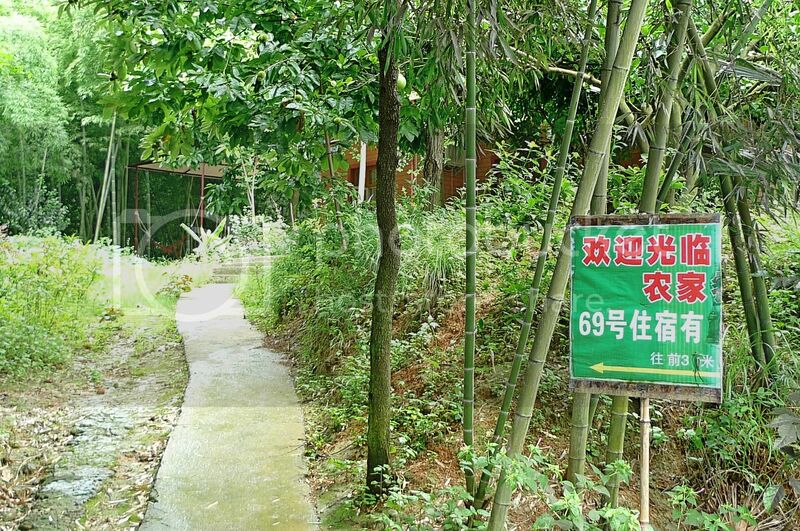 Can you see the luo han guo fruits at the left side of the photo above? 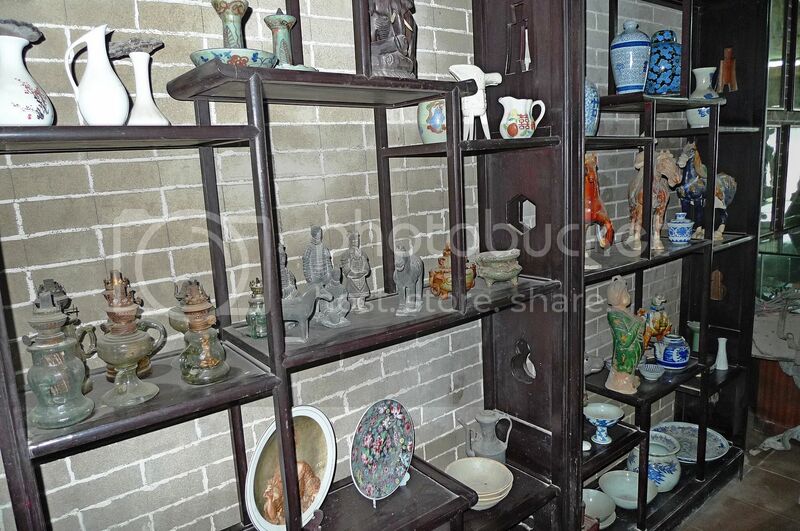 These luo han guo were quite popular and could be seen being sold at many places in Guilin. And then, I saw Jay Chou! 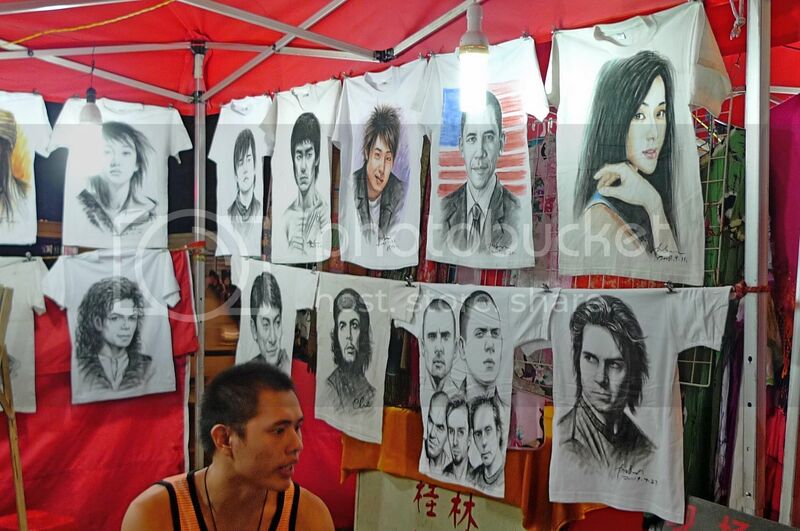 Not Jay Chou in person, but on T-shirts! Haha! 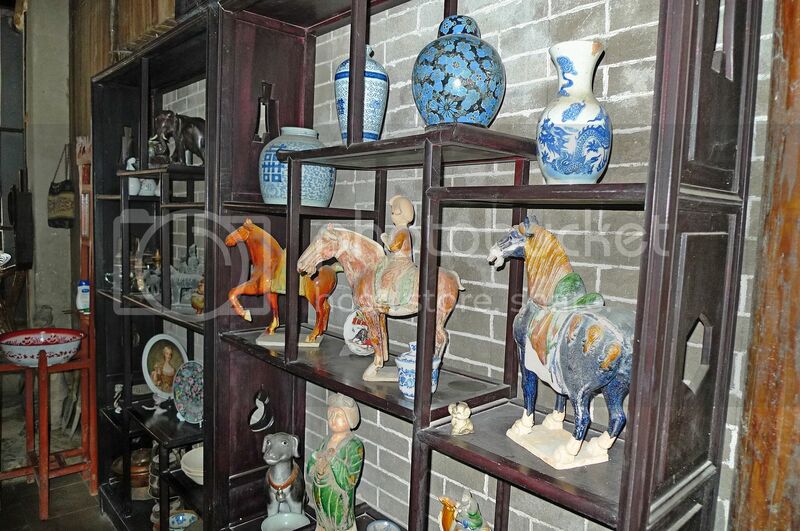 Can you spot Jay Chou in the photo above? Of course, I did not only see Jay Chou but also many other celebrities. Can you spot all the other celebrities? Oh! 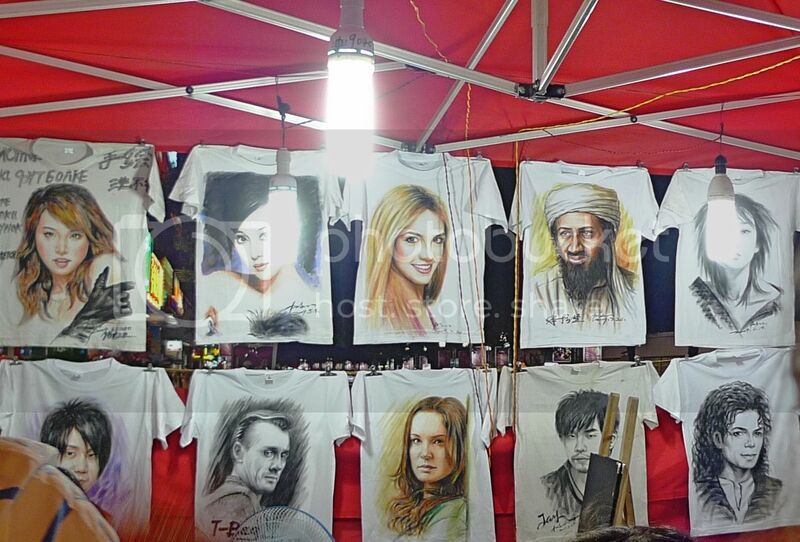 There's Britney Spears, Osama bin Laden, Michael Jackson, David Beckham, Barack Obama, Marilyn Monroe, Jolin Tsai, and more! I was quite impressed! Don't you think they are nice? It is also at this Guilin Night Market that I bought the mini mahjong which I offered as a prize for my Top 3 Commenter Contest last year. 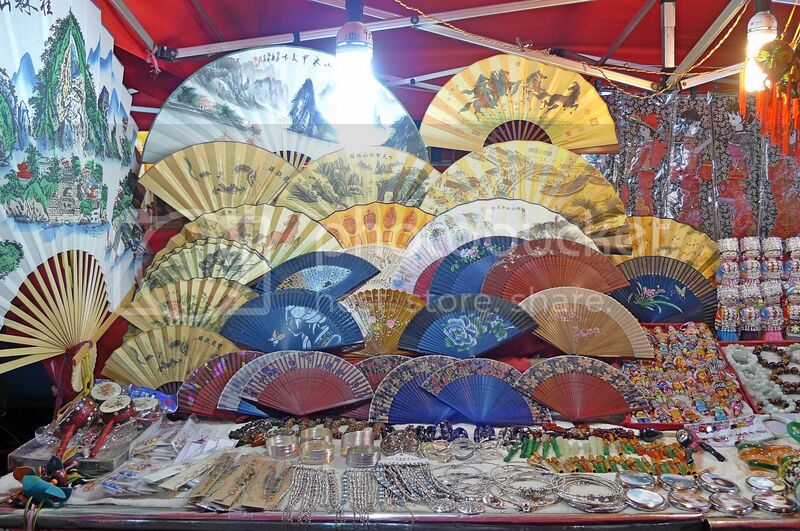 Read more about the souvenirs I bought HERE. Besides what were shown in the photos above, there were many other things on sale which I did not take photos of. Among them were clothes, leather goods and jewellery. 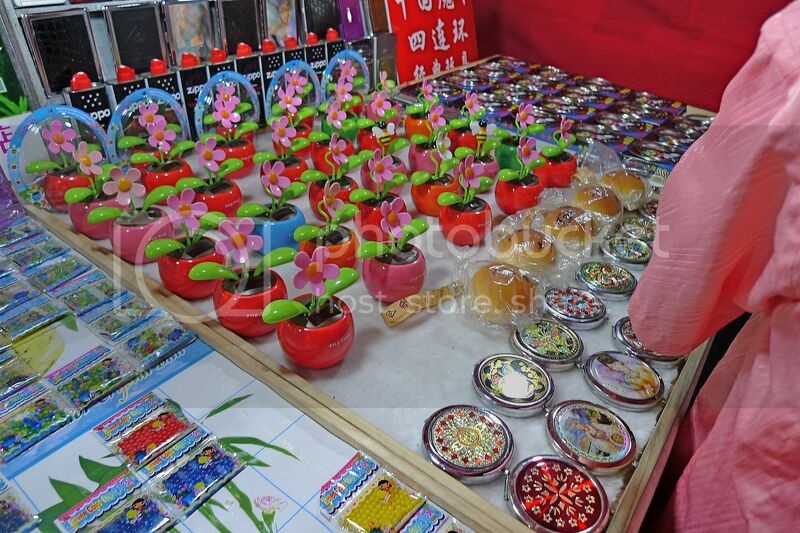 If you ever go to Guilin, do not miss the Guilin Night Market! It had been quite an experience visiting Daxu Ancient Town seeing the ancient buildings, walking on the famous Longevity Bridge and getting scolded for not paying a local old folk for showing us around her house. 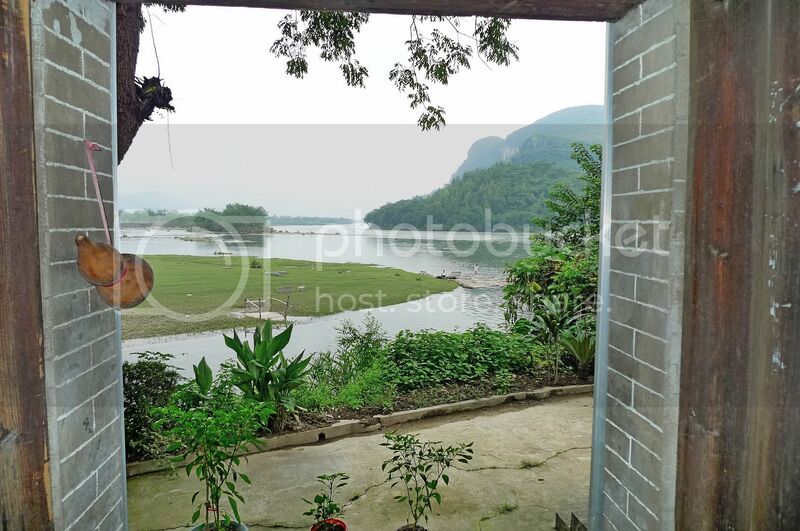 It was already 1pm in the afternoon when we were approached by this modest looking lady who invited us to have lunch at her home across the Li River at Maozhou Island (毛洲岛). 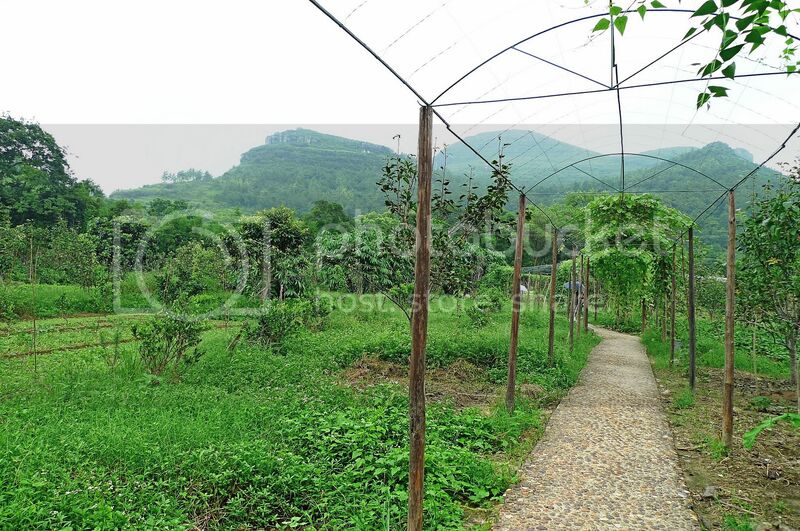 This island, which is directly opposite Daxu Ancient Town, is the biggest island on Li River and is also known as "Bottle Gourd Island" due to lots of varieties of bottle gourds being grown there. 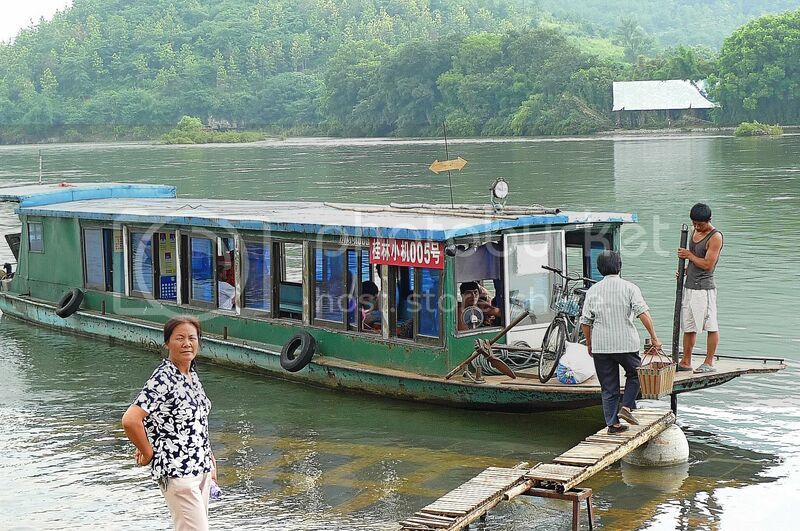 We called the lady 'Da Jie' and here you can see her waiting for us to get onto the boat. 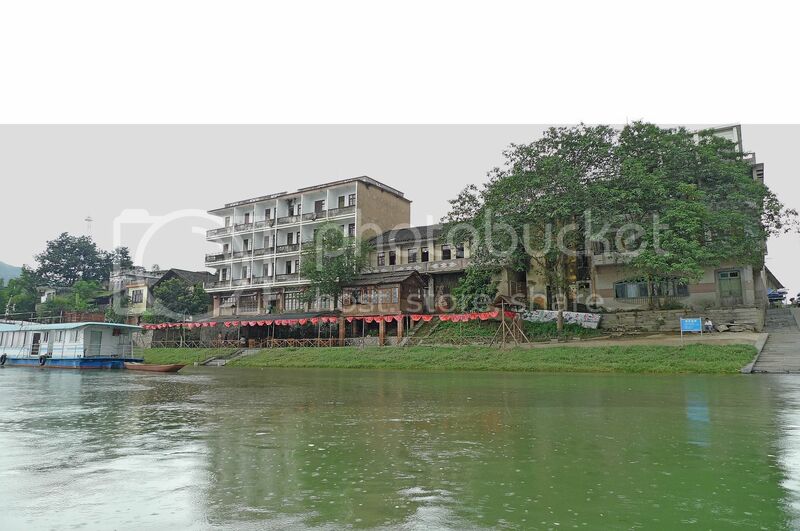 This is the view of Daxu Ancient Town as we were leaving in the boat. The boat ride was quite pleasant. 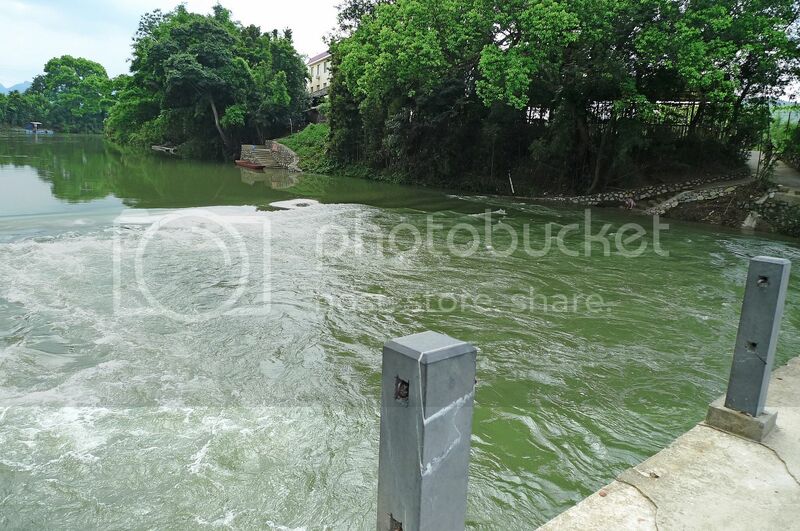 It took just 5 minutes and before we knew it, we had arrived at Maozhou Island! Climbing up the stairs, we reached the front gate. 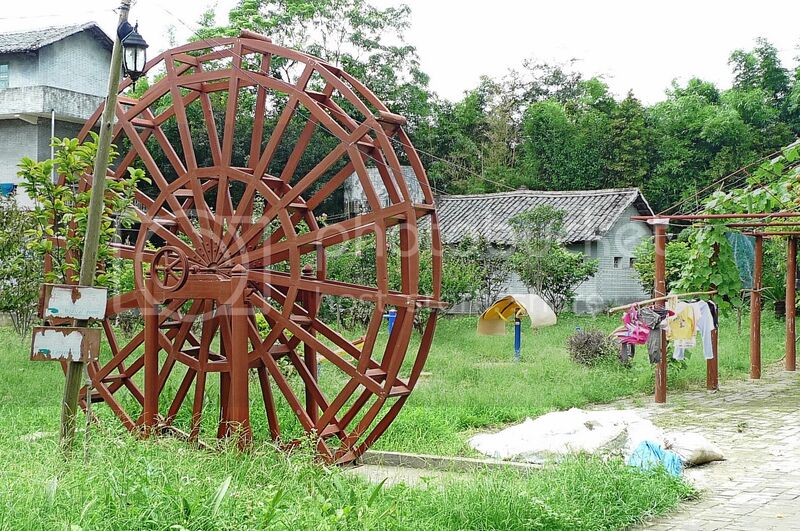 Entering the gate, we could see a waterwheel. The signboard showing the direction to Ecology Corridor (生态走廊) and Clearwater Bridge (清水桥). It started to drizzle all of a sudden. Da Jie quickly got us each an umbrella. We followed her as she led us through the Ecology Corridor, where we could see lots of fruit trees and vegetables were grown. 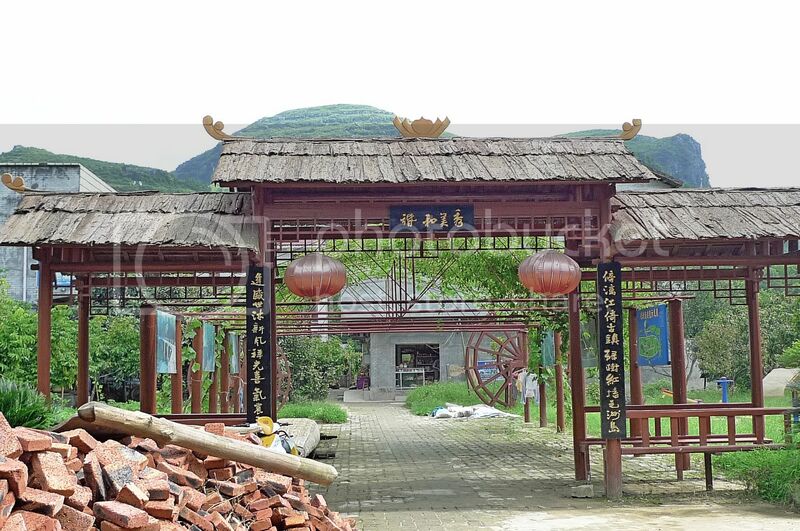 The local folks at Maozhou Island had in fact developed an ecology tour whereby visitors are invited to have a meal and stay overnight at their homes to experience the peasant family life. We did not plan to stay overnight of course, but it would have been nice, I think. Da Jie even had her own farm and she grew lots of vegetables in which some ended up in our lunch later. Soon, we reached the Clearwater Bridge. Crossing to the other side, we came across the Lovers Tree. 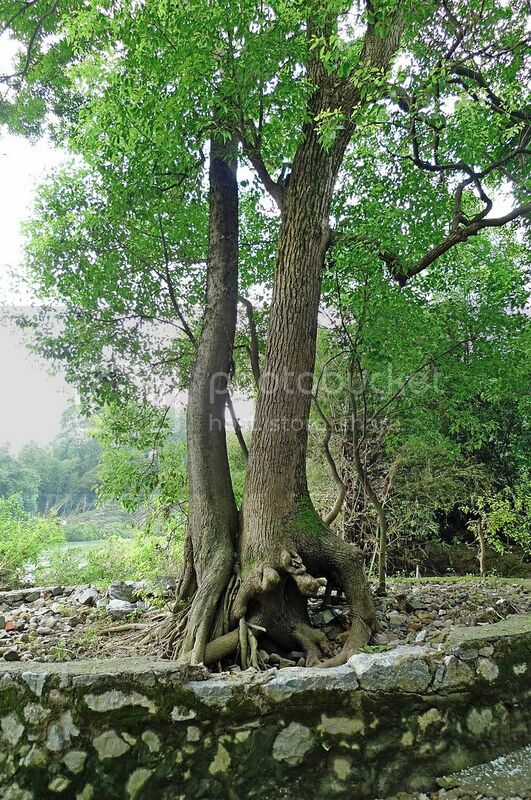 Da Jie told us that the two trees grew in such a way that they resembled two lovers hugging each other. After a few minutes walk, we reached Da Jie's house. Her house number is 69. 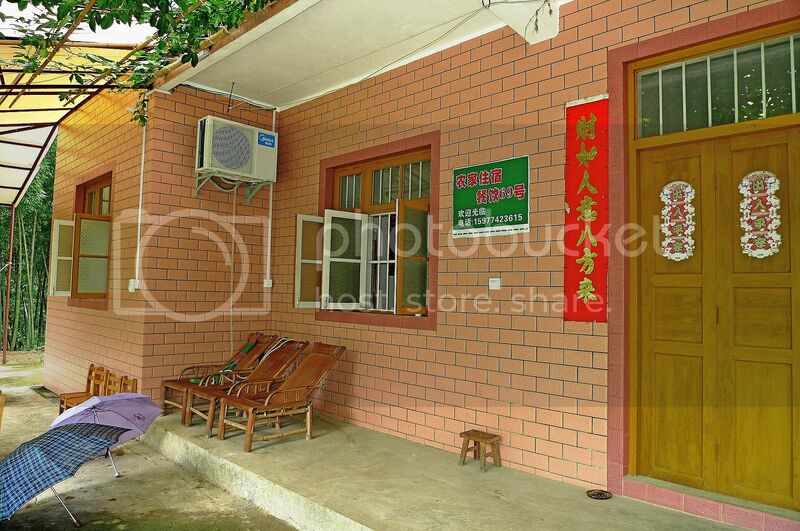 This is the front entrance of her house. 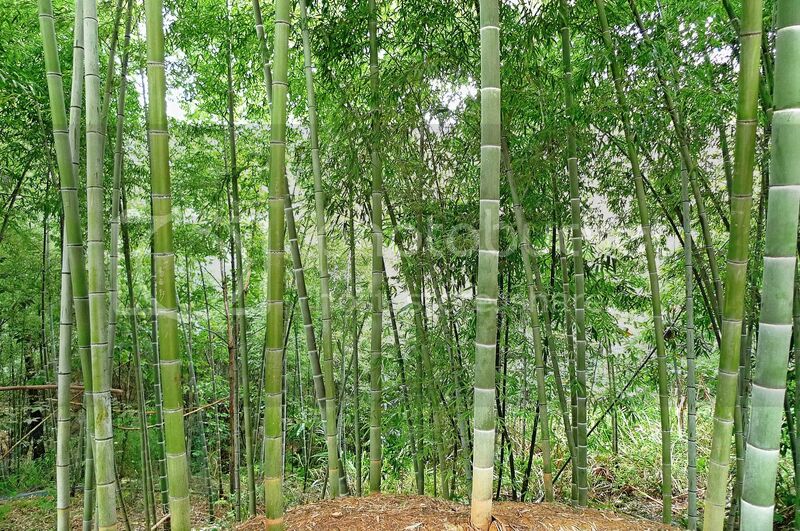 There was a bamboo forest surrounding her house. 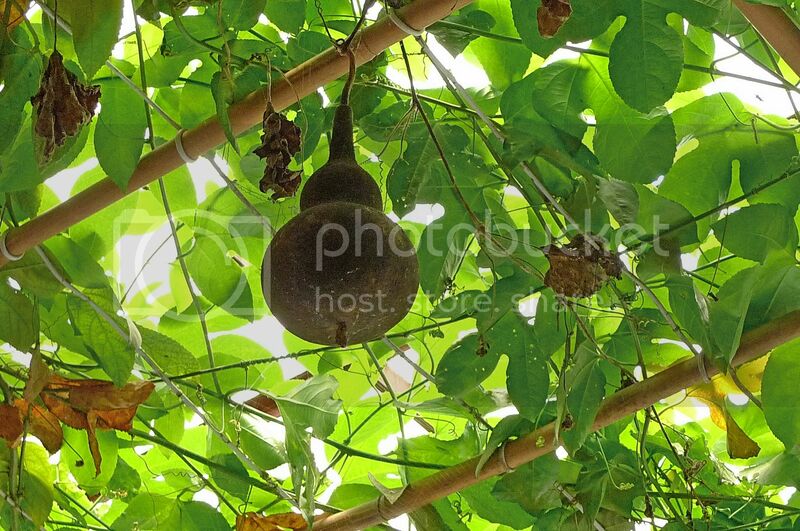 And I saw this bottle gourd hanging from the top! Once inside, we were given a menu to order for our lunch. 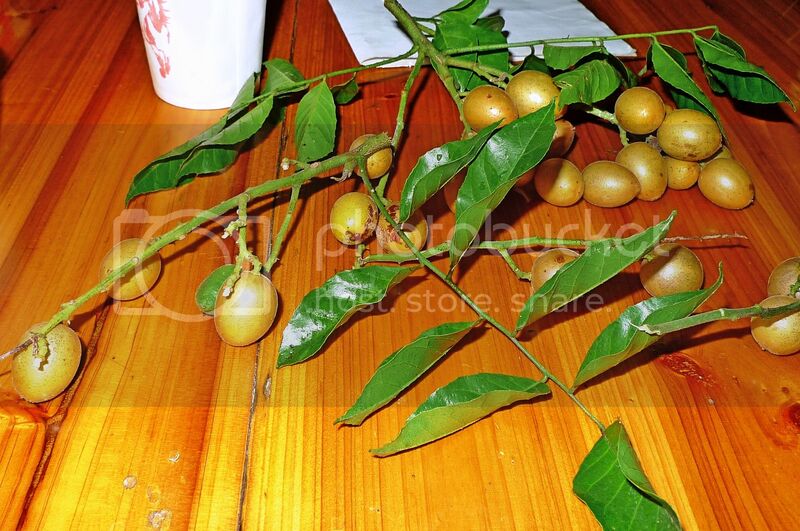 While Da Jie went into the kitchen to cook and prepare our meal, we had some refreshments and some sweet and sour fruits called Yellow Skin Fruit. 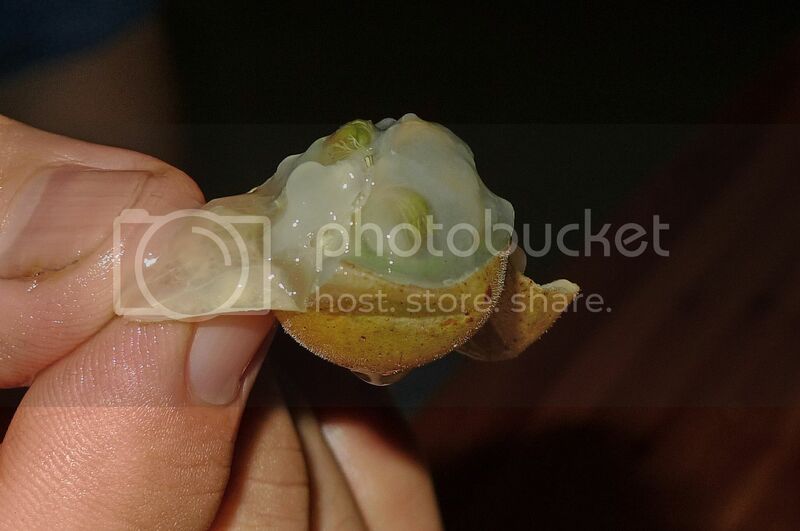 It was my first time tasting this fruit. 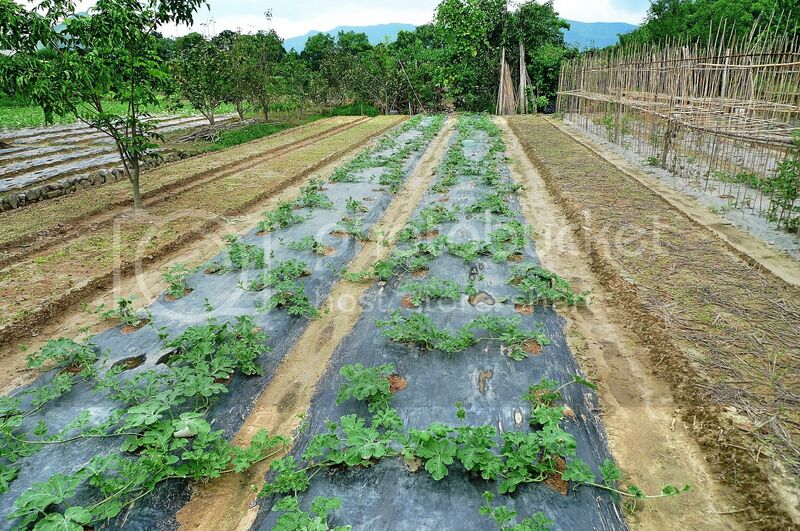 I could see a lot of these fruits being grown here. 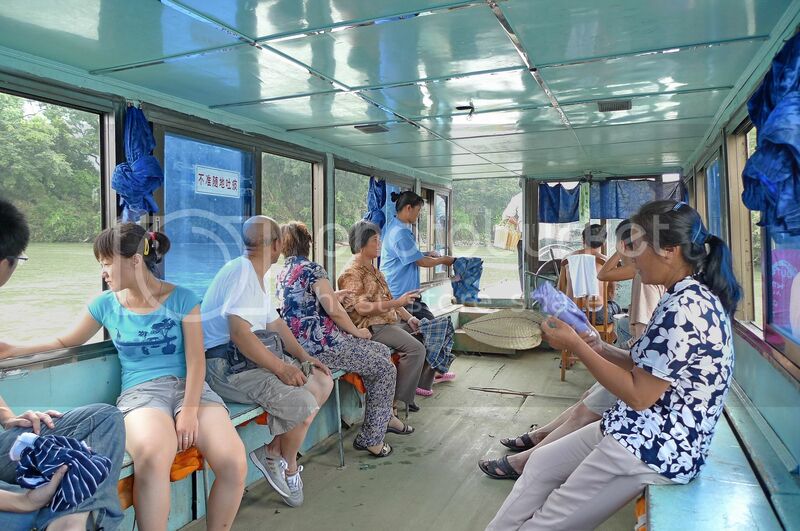 They seemed to be quite popular in Guilin. Soon, our meals were ready. We ordered stewed home grown chicken, stir fried bamboo shoots and bitter gourd with eggs. 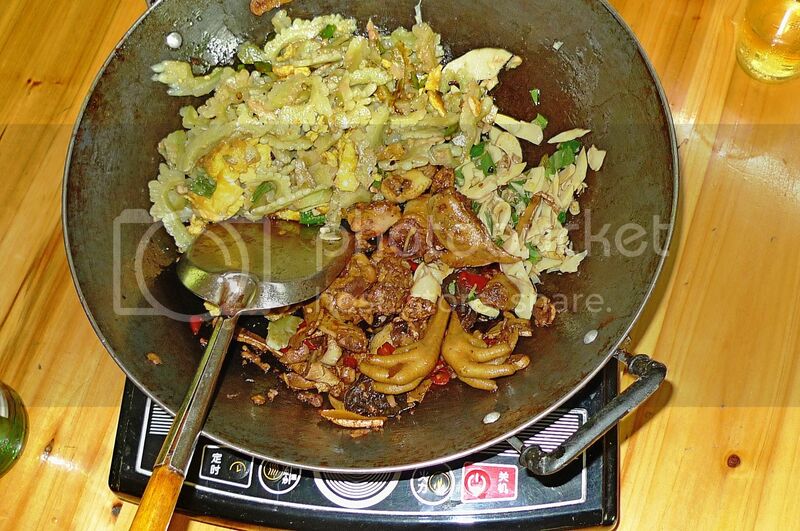 I was quite surprised that the food was served directly in the wok placed on an induction cooker! The food were absolutely fantastic! I enjoyed this lunch very much! 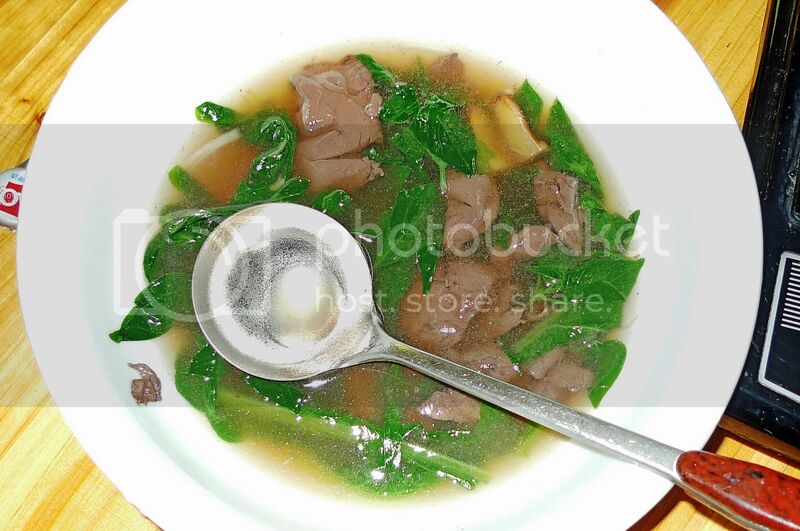 We also ordered a soup to complement the food. 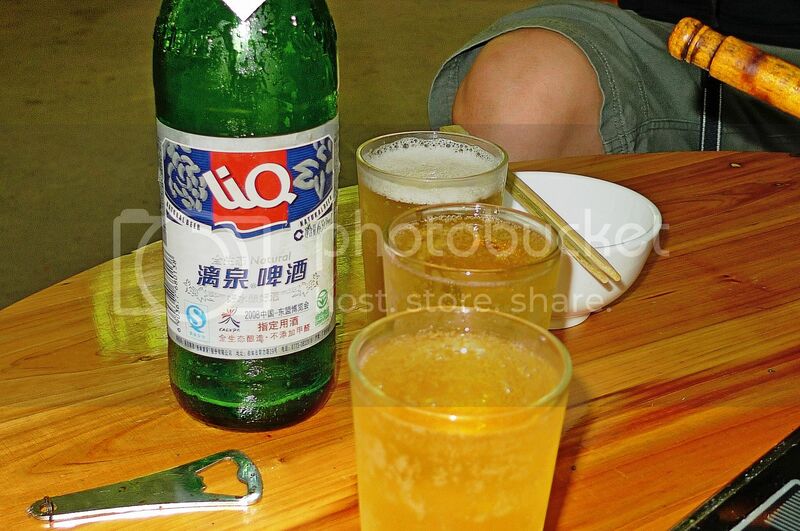 And our lunch would certainly not be complete without a serving of the local LiQ beer! I could not remember how much we paid for this meal but I think it was quite reasonable. We took some rest before leaving. 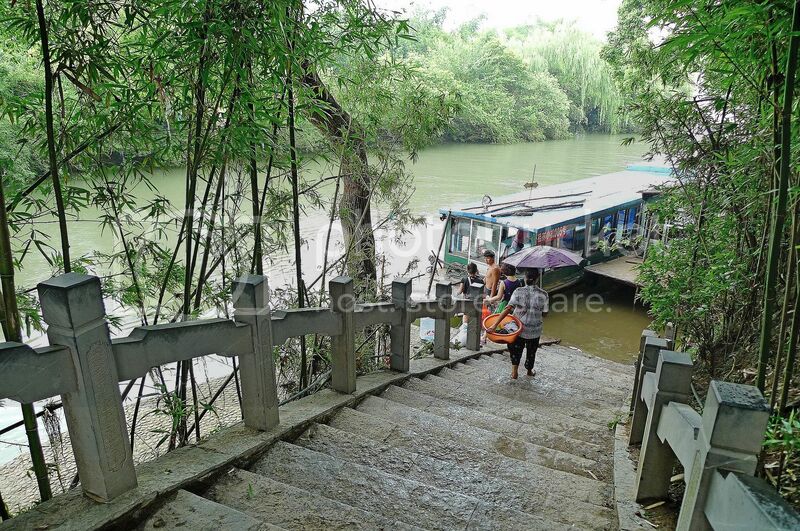 Da Jie led us back to the pier to take the boat back to Daxu Ancient Town. On the way, we crossed the Clearwater Bridge again. Walked through the Ecology Corridor and reached the pier. 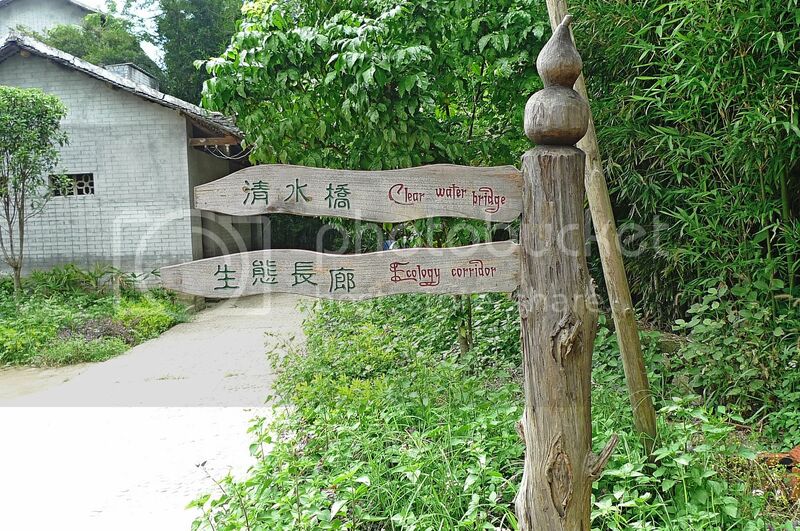 Soon, we were back on Daxu Ancient Town. Da Jie was there to look for other customers. 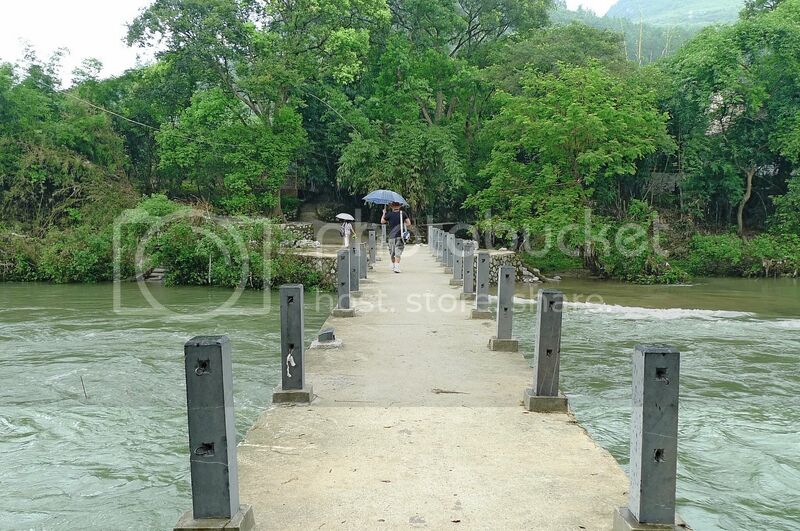 We bid her farewell before walking to the bus stop to take a bus back to Guilin. It had been an interesting experience and I was glad I visited Daxu Ancient Town and Maozhou Island! During my visit to Daxu Ancient Town, I visited a house that doubled up as a shop selling souvenirs and all sort of stuffs aimed at tourists. I did not buy anything there but I think Jam bought a T Shirt. There were many expensive looking objects on display. When I walked to the back of the house, I was awed by this beautiful scenery that greeted me! 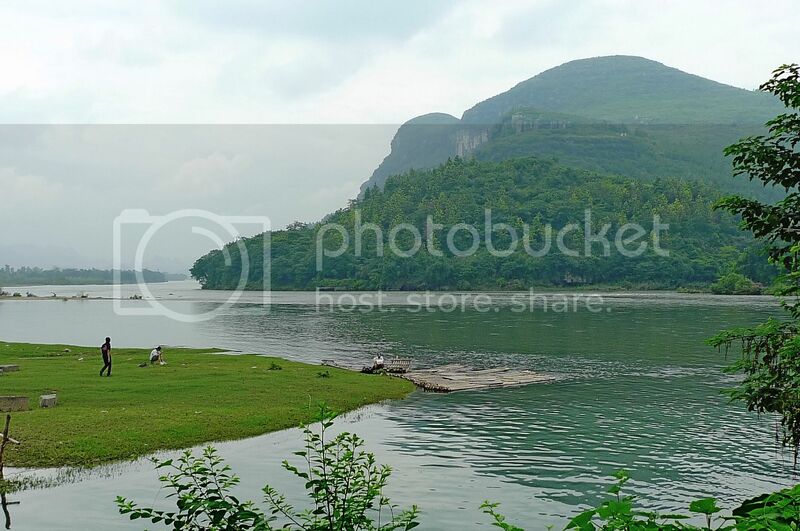 The back exit faces the picturesque Li River! How nice! 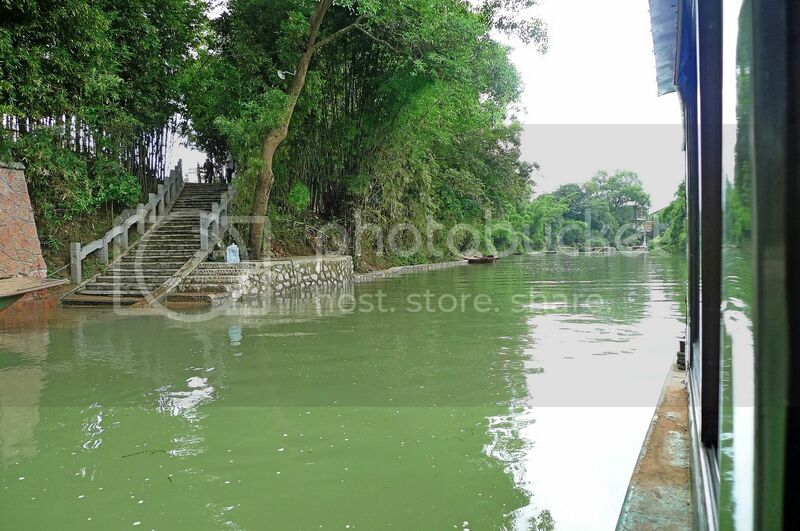 After we left that house and walked along the paved stone road, we saw this outside a house. Do you have any idea what that is? Animal poo? Haha! They were slightly bigger than the size of a fish ball. I think they were Chinese medicines but I was not sure. After some time walking, we were invited into a house by an old lady. I was not too keen but curiosity got the better of me. She showed us around the house. 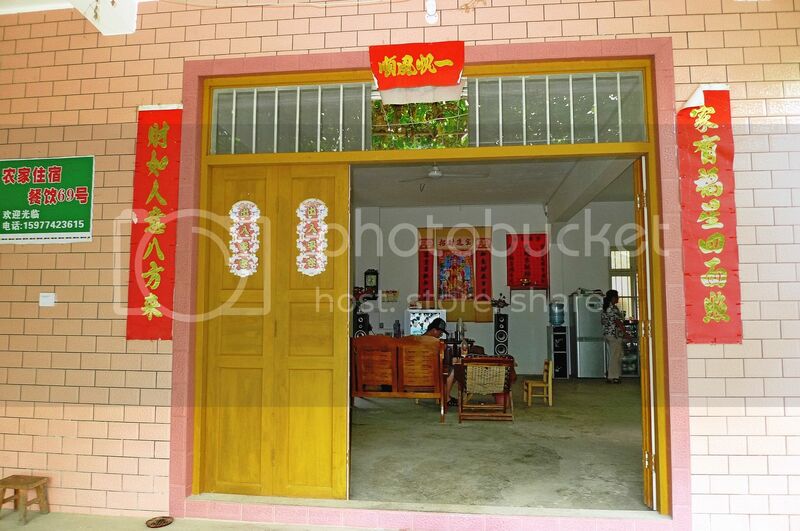 The picture above shows her describing about the carvings on the door. I was not too impressed. Haha! As we were about to leave, she started to raise her voice. I was not good in Mandarin so I did not understand what she was trying to say and just ignored her. Apparently, she wanted payment for showing us around her house! I searched my wallet but could not find a single 1 yuan note. 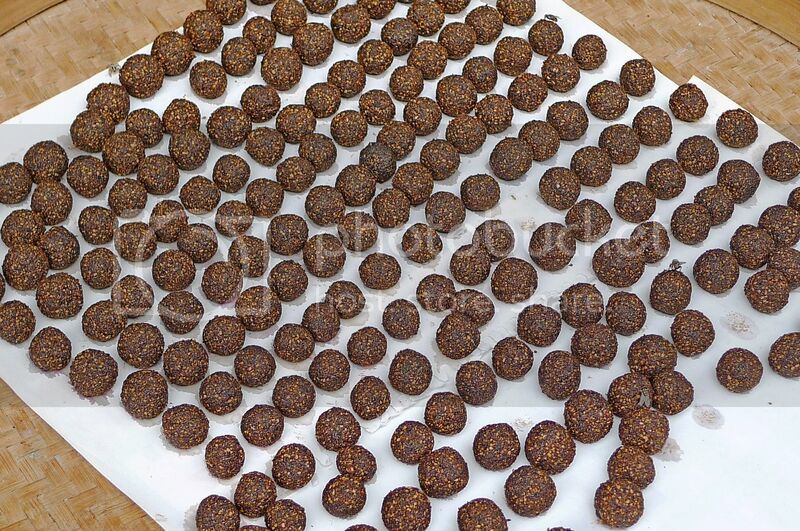 The ones I had was 20 yuan or bigger. No way was I going to pay her 20 yuan! So I asked Jam for 1 yuan and paid her. She scolded even more after that! 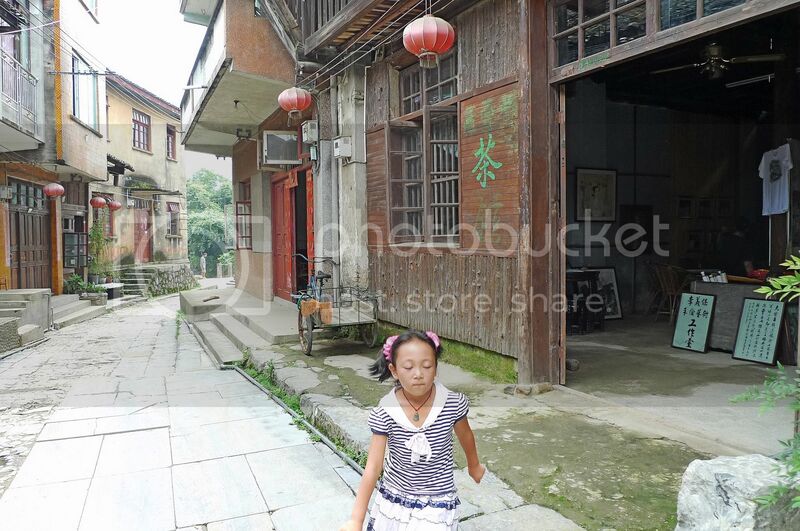 The reason was we paid her only 1 yuan! Hahaha!! We left the place quickly with her angry voice trailing behind. I could not help chuckling. Soon, we were approached by another lady. This time, it was a nice middle aged lady. 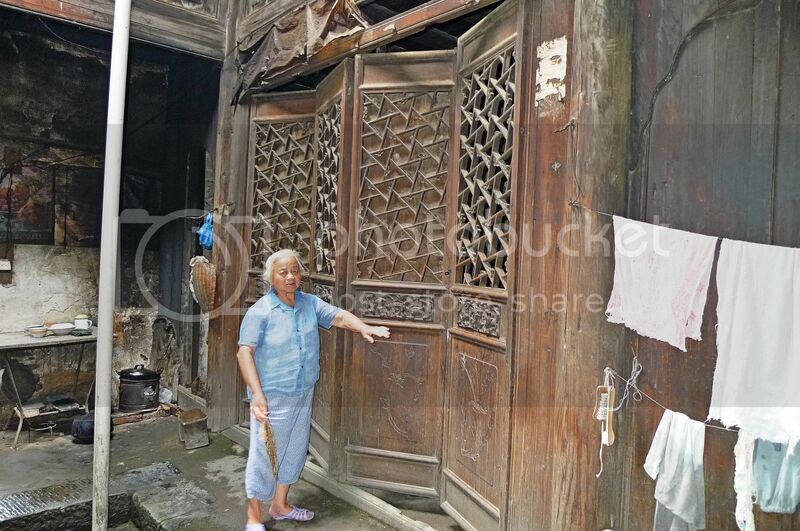 She invited us for lunch at her home at Maozhou Island across the Li River. We were hungry so needless to say, we agreed and followed her!